Interviewer Rob Vail of This Side of the Country Radio Ministry and Harriet Yoder chatted about What’s the First Question New Homeschoolers Ask? These mp3 audio files should open automatically. Transcript: What’s the First Question New Homeschoolers Ask? 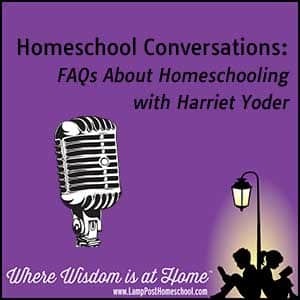 Rob: What is the most asked question of new homeschoolers when they first start getting into this, and they come to you and say, Harriet? What is the first thing they say. What is the biggest question or the first question. Harriet: Usually they are asking if I can do this? Am I going to be able to do this?” By the time they ask this question, they have been telling me their situation, they’ve been telling what their idea of homeschooling is, they’ve been telling me why they want to homeschool, why they want to do this for their child. At this point I look at them and say, “You know, everything you’ve been telling me tells me that you have a heart for this child and you have a heart to do this. If you have done this much, if you’ve researched it, if you’ve come this far, then you can do the rest of it. The rest of it is mostly diligence, praying about it, and choosing the right curriculum for your child.